Catching up with long lost relatives | Turning my world upside down! We continued our drive west towards the coast of Oregon. The terrain is surprisingly varied in the south east part of this state, starting with the desert hills of the Cascade mountains. I thought Oregon was all green and covered with tall trees, but that is not the case until you get beyond Portland. As we drove down Interstate 80, we started to follow the Columbia River, a once mighty, untamed space where pioneers travelled to get to the West. The drive is certainly not that perilous but it sure is scenic. We imagined going up the river from the sea on a river barge, much as you would do in Europe on the great rivers. We thought of all kinds of cool activities we would plan for tourists. Of course, Leon looked up the Viking river cruise company and found they are actually based in the US. So I guess if they wanted to organize such tours, they would have done so by now. We finally arrived in Portland and took at turn on a smaller highway (read back road) towards the seaside town of well, Seaside. Actually, we were headed a bit south of there in Rockaway Beach. At first our trusty GPS Bruce had us in another smaller village, but we eventually sorted that out. Rockaway Beach was just a bit further south, around a few mountain peaks. I was amazed when we finally arrived to find a beautiful long, wide beach and a thriving coastal village. Leon’s second cousin, Bryan, owns a newly opened restaurant right on the beach. 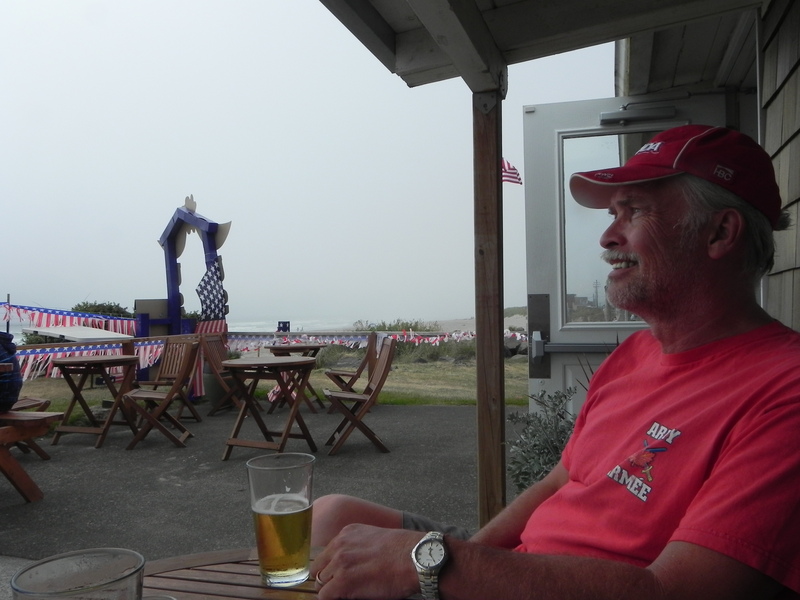 Sitting on the patio of the Sand Dollar, we ordered a much-deserved beer, having driven another 12 hours that day. The patio overlooks the ocean but a bit of a rainfall seemed to be coming in, so we couldn’t see the full beauty of the ocean at that point. We asked about Bryan and were told by the hostess that he was indeed around the restaurant somewhere. It was a busy day and they were a bit short-staffed, so it took a second request to see the boss. Bryan came out to meet us and said the usual, Hey, it’s been a while, right? We asked a bit about the restaurant and he answered, excusing himself to continue with some of the restaurant duties. By the time we got our meals (mine was grilled cod, Leon’s was a salmon in cream sauce), it was clear that Bryan had no idea who we were. Of course, I could understand him not knowing me, as he would have never known about me until now, but I figured he should remember Leon as he had attended Leon’s youngest sister’s wedding about 25 yrs ago. So I asked him how his father was the next time he walked past us. He stopped, a bit startled by the question. I stated that he had no idea who we were and that this was his cousin Leon. Of course Bryan remembered Leon! He had been told that Lenny was looking for him. At any rate, we had a lovely chat, punctuated by his many duties in the restaurant. After dinner, Leon and I went for a nice walk on the beach, in spite of the rain. Bryan had invited us to use the restaurant parking for the night, so Leon moved Roadie closest to the dumpster (that Leon, he takes me to the best places), after which time we sat down for a nice glass of wine and another view of the ocean, which promised a decent sunset as the clouds cleared. We chatted briefly with Bryan and his daughter and said our goodnights and goodbyes as they were needed to close out the evening at the restaurant. It may not have been the reunion we expected, but I guess when you drop in on people after 20 some years, you can’t expect they will even recognize you. I wonder how many of my own cousins would know me if I ran into them? If you get a chance and are in the Rockaway Beach neighbourhood, do drop in for a lovely dinner and a darned nice view of the ocean at the Sand Dollar.